My head is filled with too much, information and thoughts floating about, making connections the way water shortcircuits a switchboard. What I am looking at within my mind is the rhizomic network of life. The organisation of the college is taking shape, not into a neat model of ordered hierachies, but into a complex conglomerate growing from need and want, not plan, like a medieval city. The weblog research and topics are expanding and contracting like a heartbeat, suddenly filling one area, retreating, another area, retreating, flushing into and overwhelming some - uneven in the fields it touches, but steadily carrying on. The world of NeverWinter is the most ordered, a neat retreat until I start turning over digital rocks to see what intertextual references crawl out from under them, and it leaks into the rhizome of my mind like litte blue pools of dystopia colouring the thought processes. And on top of this I am struggling to organise the web of teaching and administration into something resembling the thing I actually get paid to do. But this was not supposed to be a whine fest, because I am not whining at this moment. I am starting to penetrate the chaos this appears to be, and see how different problems give birth to different thought processes, and I am enjoying how the language of text and game studies lets me express my experiences. At the organisation group meeting last week I was able to give shape to an alternative organisation model for the central tasks of the college faculty. The weblog article is taking shape for my inner eye. I may start interviewing people for a job here next week. I have a date with Hilde about when to write the NeverWinter article. I have the tickets for the trip to New York May 20th. The alarm is going off for the meeting I have to attend right now. The rhizome of my everyday life is starting to make some weird sense. 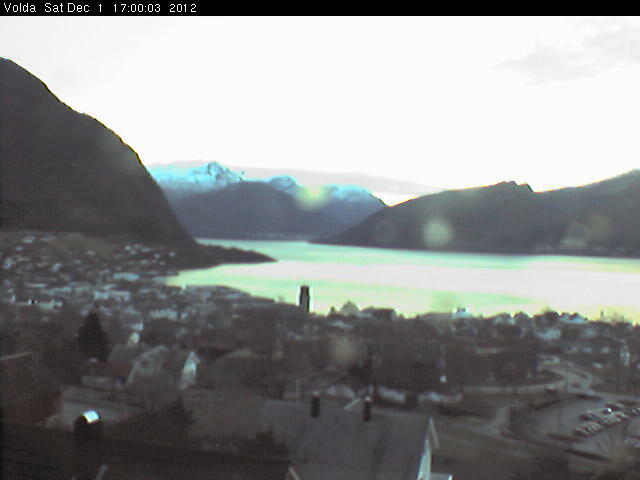 And he comes from Brattvåg, which is right next fjord over from the closest thing I have to roots! When the paper claimed he came from a Village between Bergen and Trondheim, I got really curious, and thought I had to check where he really comes from. And they were right. Brattvåg is exactly that, a village between Bergen and Trondheim, although it's just north of Ålesund, which I think is worth mention. I think that's worth mention because I can understand how a good, personal and enthusiastic conductor can grow out of the amateur brass- and janitsjar bands of the area - but at the same time I think it's a small miracle, as it's even further from the global bellybutton than Volda (but only by a hair's width, I admit). Brattvåg is where the rough crowd at high-school would go to dance and fight. They build boats, farm, and play in the brass Band. Did you see Brassed Off? Brattvåg is that kind of place, with that kind of bands, and that kind of enthusiasts. It's just much further from Royal Albert Hall - or any other significant concert halls worth mention - and instead of being coloured grey by coaldust, it smells of fish. But Arild Remmereit is from Sunnmøre, and of course, there's absolutely no reason why he shouldn't aim for the stars and get there. Now he conducts in Vienna, Paris, at La Scala. The boy the next fjord over. Isn't life amazing? As the days are longer and the weather gentler, it is so much easier to be outside and active. The winter is turning into a bad memory with its painful struggle against desperate, meaningless exhaustion, as I take the time to get back into shape. Walking the rough paths of Volda is not just great exercize, it's also a chance to breathe some of the cleanest air the planet has to offer. 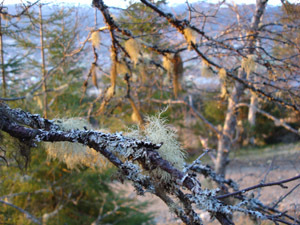 The beard on that tree is a particular lichen which is very sensitive to pollution. 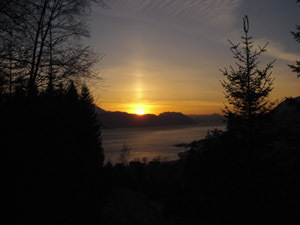 You will not find it in gardens in Volda, but once you walk for 10 minutes uphill away from the main roads, it is there. Today's top story in BusinessWeek online is on blogs! Nothing new or surprising in the story, it basically says "blogs are used by too many to be ignored, get a blog or miss an opportunity". The way I found this article is however worth some mention: I was chatting on yahoo instant messenger with a random collection of people, and in one window I mentioned I had a blog. This got a peculiar reaction from the other end, and a link to BusinessWeek. Turned out I was chatting with one of their economists. Now isn't that the world wide web for you! Over the last couple of days I have been butting my head into the "where are the women XXXXX" issue again. First at bloggblogg, the Norwegian blog discussion blog, where Elise writes (in Norwegian) about white men in the blogosphere. I can't wrap my head around the male-dominance of the blogosphere, because I just don't see those white men. I see that the newspapers love linking to white men, and I see that the stories of some famous bloggers are about white men, but the blogs I read are not. My hypothesis is that the white male dominance exists among the people who write about the blogosphere in the mainstream media, not in the actual blogosphere. If the people who write about blogs only read the blogs of men who address topics the original writer was interested in, and link to others with similar views, the silent majority will never speak, and we have a spiral of silence, as described by Elisabeth Noelle-Neumann. Last night, out of nowhere, the blog paid off (again) in the way I have always, secretly hoped it would. What happened? another friend who had slipped out of touch found me, updated himself on what I am up to, and got in touch. And in doing that he triggered a train of thought, as I tried desperately to remember where I had quoted him in the thesis, and the name of the incarnation I quoted. It was Olaru, who had played at Azhad, but before that had been the Prince to my Prince's Hand, the fair front to my sinister shadow, a companion through heavy online role-play for about a year. And so he had offered me some of the more interesting examples in the thesis, although I never interviewed him. He was not in the original Dragon Realms sample. But he illustrated the act of speaking silently, which I in the thesis introduce as an inverse to Barthes' writing aloud. Where writing aloud depends on the body, speaking silently depends on the text, and Olaru did that eloquently. And for those who are curious, the passage starts at page 39 of my thesis (warning, big pdf), and Olaru appears at page 40. Of the theory I am looking for, that is. Writer Response Theory. It all makes perfect sense now. Oslo girl meets the aggressive attack on the Norwegian idea of wealth in a sober manner, carefully pointing out how Bruce Bawer's article in the New York Times is highly biased - and in this case against Norwegian culture. I read Bruce Bawer's article fairly baffled, and try to make his observations on the Norwegian culture fit the country I live in. My packed lunch is a result of my poverty? Wow, I didn't know. And the problems in the health system and the educaitonal system is a result of poverty, and not of the recent political trends? Well, about time somebody told us! The article reads as if Bruce Bawer has a hard time adjusting to Norway. He was shocked that a hospital was out of cough medicine. I was shocked at the lines at the clinic in Bay Ridge, Brooklyn, when I had to wait at the desk with high fever, swaying at the edge of fainting, while the staff were arguing about whether they could take my credit cards, as they did not accept the travel insurance. Individual, surprising experiences shape our opinions of other cultures. Bruce Bawer describes the packed lunch as a hero wrapped in wax paper, American concepts for an American mind in order to understand a genuinely Norwegian item. Other words in the article which expresses cultural differences is for instance the use of the word "frugal". Bruce Bawer uses frugal as if it is a bad thing, as if it's undesirable to use your appliances until they are worn out, or your furniture while it still serves its function. In a world where we are already drowning in the mountains of garbage from the consumer culture, we should express our wealth by throwing more stuff out? "Frugal" is not a failure, but a virtue seen from this side. This article is interesting because it reveals the same as I experience every time I go to the United States. The place appears to be so familiar, but when ever I learn a little more about the culture, I discover that it is alien, that things do not mean what I thought they did, and I can not use my Norwegian background to interpret the American society. Bawer's words on the Norwegian social system are familiar - yes, we know it's not as good as it should be, and we're discussing that constantly in Norway - it is his interpretations of the little things which are so - off. And yes, the article fits neatly into the Norwegian "how do we look from outside" project. Which, of course, means that it gets a LOT of attention in Norway. Nothing like noticing Norway for flattering Norwegians, even if you just don't get us! Two articles on social bookmarking tools, one general and one case study of a system called Connotea, from D-Lib magazine April 2005. I just made a slightly absurd discovery. On my logitech keyboard, just over the arrow keys, under the delete/home/end/page up or down keys, something is printed: "Advarsel! Noen eksperter mener at bruk av hvilket som helst tastatur kan forårsake alvorlige skader. Les informasjon på baksiden av dette tastaturet." - which means: "Warning! Some experts think that the use of any keyboard at all can cause serious injuries. Read the information at the back of this keyboard." Curious, I turned the keyboard over. And sure enough, there is was, a little list of what do do and what not to do while using a keyboard, in order to avoid serious injury. I don't follow those directions, for instance, I like to rest my hands on a pad for that purpose just below the keyboard, that way I don't strain the shoulders so badly. But I also don't rest my arms or writst on anything with sharp edges. If nobody had warned me, I don't think I'd even have considered the possibility of resting my writsts on anything with sharp edges while writing. Now my head is filled with ideas. I guess I need to get busy with something a tad more interesting than what I am up to today. My husband, who has learned the consequences of saying "aren't computer games dangerous?" came home last week with a new saying: "Du må ikkje wowe. Du må sove i natt." This means: "Don't wow, sleep tonight." For those of us who are not all that deeply into teen-language, "wowe" in Norwegian means to play World of Warcraft. It appears that WoW is so addictive that the teen-agers are loosing sleep over it. The discussion at the meeting he attended was not about whther the kids would become criminals if they learned how to bash orcs over the head of use a morningstar to slay goblins, the problems were quite real and present: kids are playing the game so much that they don't sleep at night, they are shivering wrecks acting aggressively if they are denied computer access when they come home, and their grades are dropping severely, as they do no homework. I have to admit, in our household the constant repetitions of "du må ikkje wowe" had the wrong effect. Apart from alternative warning poems ("Du skal ikkje wowe bort sumarnotta, ho er for ljos til det" as my favourite (original text here)) offered from all members of the family, I immediately had to buy the game! Which, of course, leads to amusing conversations between concerned father and delighted son (also known as research assistant): "you must not wow, you must sleep!" "It's not a game, is a sacrifice, the research needs me!" In order to work with the subjects I need to focus on to develop my research, I need to push the administration and teaching away from my mind for compact chunks of time. The last few weeks I have been spending 1-2 days working at home, in order to be allowed to focus undisturbed. This has been a blessing in many ways, for instance I work more relaxed, which is better for my back, and I don't get interrupted constantly, which is better for my head. After the first somewhat stressed attempts, I have now managed to organise the home-days in a way that lets me drop into the flow of writing and doing research with - if not ease, then at least not the effort it was a month ago. Now I have problems at the other end of the scale of my tasks. Due to the many reforms, both structural and technical, the routines of running the college are fluid - and not in a nice, gentle malleable way, but the way water undermining a dam is fluid. If I spend a couple of days not paying attention to the many decisions being made at all levels, or if I notice, but fail to consider how they concern the work I am responsible for, I end up doing twice the work with half the result. Today's example: I had planned to spend the day on a thorough revision of the course descriptions for the Information education. Last week I discussed this with the staff, they and I started doing some initial proofreading, I attended a meeting on the juridical side of the course descriptions, and I was ready to sit down and do a good, decent course-administrative job, the kind of stuff responsible professors are supposed to do. Only to find that over the week-end, I had no more access to the plans. Somebody had decided that because this was too chaotic and difficult for random professors to be doing (and to a certain extent it is), one person was to do all the work for the entire department. Which, of course, is a joy, I could have taken some notes on a piece of paper and passed him last week, told him to figure out the implications of the changes in the educational law for the descriptions, and gone off to do something else. Instead I did twice the work I needed to, only to have another person doing the job I had been preparing for. It's such a waste: of my time, of his, of the sparse resources of the college; and I wasted it because I had let a memo slip by while I was keeping my mind on the research - that is, doing my job. It is not just a dilemma, it's a catch22 - I can't get it right, ever. So unknown hands are opening and wandering through baggage and nobody knows or will acknowledge who the hands belong to. Nothing was missing from my bag, but I remain puzzled as to why nobody will admit they did it. Some form of notification should be required of anybody searching baggage. At least then we would know whether it was a legitimate inspection or a thief unsuccessfully searching for booty. His situation was not the same as mine, as I was properly notified, but his email has the same flavour of insecurity and discomfort with the baggage handling on international (again, transatlantic) flights. Together with the reports of items just plain stolen from suitcases left unlocked - in order to comply with the regulations - and the fact that I now, after two such inspections need to buy a new suitcase, as the locks are pretty much shot on the one I have, this paints a less than pretty picture. But what can we do? All I can do is to make sure I don't carry anything valuable, of sentimental value or irreplaceable in the regular luggage. Even if it isn't stolen, it can be accidentally lost as the luggage is checked. Also, I must make sure to have spare room in the suitcase. No more filling up all space with souvenirs, instead, practice travelling light. Look inside the luggage when it comes off the transport band. I can't check it into the next flight and swear nothing has been put into it, unless I look. Yeah, this part will be fun, paranoid travellers opening suitcases all over the big international airports. But as we have to carry the luggage through customs in the country of destination, I see few other options to the "who went through my luggage" dilemma. Of course, we can be un-paranoid and trusting. Like the TSA. In general, semantics (from the Greek semantikos, or "significant meaning," derived from sema, sign) is the study of meaning, in some sense of that term. Semantics is often opposed to syntax, in which case the former pertains to what something means while the latter pertains to the formal structure/patterns in which something is expressed (e.g. written or spoken). Definition of Semantics, From the Wikipedia. We invite proposals for papers to be presented at the conference Aesthetics of Play, to be held at the University of Bergen 14-15 October 2005. The conference is hosted by the Department of Information Science and Media Studies, and is arranged in collaboration with Norway's first game-art exhibition at Bergen Kunsthall. We invite papers that address the diversity of cultural meanings as they are expressed in computer game technology and software. The notion of 'aesthetics' in this context is a broad one, encompassing the formal structures and audiovisual characteristics of games and game technologies as well as the wider epistemological, cultural and political dimensions of the gaming experience. Our aim is to contribute to the continued development of a cultural aesthetics of computer games, allowing us to better understand their role as mediators of cultural change. We especially want to encourage contributions that offer analytical 'close-playings' of particular games or genres. We invite a broad range of game-centred approaches, hoping to attract a rich mixture of highly focussed and particular investigations as well as broader more speculative work. Abstracts of maximum 300 words should be submitted by 18 April, 2005 via the conference website http://www.aestheticsofplay.org. Notice of acceptance will be sent out by 29 April, 2005. Presenters will be asked to submit the full papers by 16 September, 2005. All papers will be published in the online conference proceedings. Watch the British Royal family dance (they must have learned from Paul). As a little bonus, you can see them ROCK! And cool down after that hot experience by learning what Marvel superhero you are! Today's weather is just disgusting. I don't want it. if you want to see what it's like right now, this is a link to a webcam by voldaveiret.no. It's 15.22 Norwegian time, and the weather is just no fun. Today's experiment at Demostasjonen (yes, a play with the words democratic, demonstration and station) using Skype to set up a webcast, was both a failure and a success. A failure because the very ambitious program with 10 people debating from different parts of the world fell apart when three of them could not respond or were just knocked offline - a success because the remaining 7 actually could participate in the webcast. The debate was rather silly. My colleague Nora came in, just to laugh with somebody, the moment the webcast was over. We were to talk about gender, men and women, and none of us had been briefed on what they wanted us to say about men and women, so both Nora and I chose similar strategies for the event. We picked a role for today: "This is the person I am for this debate, and this is what I talk about." We luckily did not pick the same type of person. The hosts were desperately trying to keep the webcast within the conventions of radio, with jingles, pause music and carefully planned time. This is a format that gives a certain framework and security, and it makes sense if there is a time restraint on air time on a certain frequency. But as the only "frequency" is a URL, theoretically there is no such restraint, and they could just have gone on and on as long s they liked. Of course, none of the participants had time to stay online for hours, but for an open webcast we can imagine a discussion going on for as long as the moderators and the debaters care to keep it open. Potentially, this could be the Brechtian Radio to the People, where everybody can webcast to everbody, easily and free. Lars Nyre, the PostDoc in Bergen who is running the democratic radio eksperiments, is more of a theoretician than a technician, but with the help of students and technicians here at the college, this was not too complicated to go through with either. As for participating, that was plain good fun. And I got a good laugh together with Nora. That was worth it, too. For Norwegian readers and everybody who like to peek at fun drawings: Torbjørn Lien, the graphic artist and creator of Kollektivet (the collective), has a graphic blog called Lienbloggen. Torbjørn works at the Media department at Volda, College, and teaches at the Animation education. A project at Volda College and Bergen University is about democratisation of the broadcast media. Friday the first webcast in the project will happen at 2 pm Norwegian time, and I will be part of it. It will be in Norwegian, but as you are all working hard to get fluent in order to apply for the position here at the college, that should be no problem. If you read Norwegian and are concerned about the consequences of the quality reform on research and teaching in Norwegian higher education, have a look at this article from bt.no. For English readers who are curious: It's a reminder of the things which have always been good about the Norwegian educational system, but which are now in danger of being reformed away. The Norwegian educational reform has been happening so fast that there has been no chance to merge the best of the new with the best of the old, and so a lot of the things which made Norwegian education different in a good way is in danger of being lost. One such thing is for instance the way students have been immersing themselves in disciplines for a year or two, rather than skipping from topic to topic, covering 4-6 topics in a year, frequently from different disciplines, as now happens with the new way of organising their studies. This also means that there is not enough time to integrate the students in the research of the professors, even at a master's level, and it fragments the process of learning, emphasising knowledge rather than understanding. A lot of the valid frustration with the quality reform (there's lot of frustration based on loss of power,positions and influence, or just on fear for the discomfort of change, for instance), is related to this: that the reform leads to lower quality rather than higher. So far very little has been done to make the actual teaching and research better. It's all been about giving students more options - more options and a weaker menu to choose from, I - and many professors with me - fear. December 1st - December 3rd, Copenhagen, Denmark. Denmark, from December 1st to December 3rd 2005. Researchers and practitioners from all related disciplines are invited to participate in this event and to exchange ideas, theories and experiences regarding the state of the field of digital arts, cultures, aesthetics and design anno 2005.
design and production of digital experiences How do practitioners (programmers, artists, designers etc.) cater for this kind of active and demanding user? What kinds of experiences can we create? How can these experiences inform us? How do we as academics analyse and evaluate digital experiences? DAC has always been interested in exploring the ways in which digital media do things that traditional media cannot. We believe that the focus on 'experience' in DAC 2005 will illuminate the possibilities of digital media beyond the functional possibilities of 'usability'. What are the aesthetic and cultural implications of digital design as experience? All papers will be reviewed by an independant review committee, which will provide written feedback on each paper. 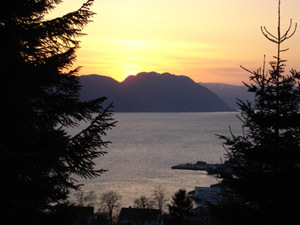 That is, if you always wanted to work in Volda for a year, with me as your boss. Just learn Norwegian, get some experience in Public Information and a degree in media theory, and apply to this position before 27th of April. Then you'll have a shot at living and working in one of the most beautiful areas of the world, plenty of fresh air and lots of brilliant students! What should we make of blogging? This is still the question for journalists, according to BBC news. Obviously by now, journalists should have discovered that the internet is changing the context for their work, and in not too long it will change the structures of the organisations they work within, as well. The article starts out, however, with a very interesting discussion on sensorship in China. The internet is known for its open characteristics that make it hard to control. Western media argue that the internet poses considerable problems for the Chinese government that attempts to uphold an information monopoly. This paper attempts to counter this argument and discusses to what degree the Chinese government can control the internet in China and, more than that, to what degree the internet can be used as a means for control. We will analyze how the Chinese government establishes internet control from a legal, technical, economical and social perspective. The concept of the Panopticon prison, invented by Jeremy Bentham and mediated by Michel Foucault, will be used as a metaphor to illustrate that the Chinese government has all the tools at its disposal to further enforce control of the internet, by way of the internet. The message of the article is dark, almost dystopic, and makes an even stronger impact as it is delivered through well-informed, cool, and clear scholarly analysis. China is still controlled, different and struggling for freedom of speach. Our concern with not being allowed to distribute all the music we like is a luxury problem in this context.